Only 65 miles north of New York City is one of the best kept secrets in the history of US architecture. The City of Newburgh with her charm is a contrast of style reflecting old and new. Known as the “crossroads of the republic”, Newburgh has been on the map and in the US history books touting pre Revolutionary War stories. George Washington himself lived by the river and his headquarters remains one of our local treasures. In keeping with the thought that “nothing stays the same“, Newburgh has evolved over the years. In her day she has seen many historical figures come and go, from Franklyn Delano Roosevelt to Thomas Edison. In her more glamorous years, the Ritz theater saw Lucille Ball and Desi Arnez make their stage debuts right here in Newburgh. What remains behind is the charm and fabulous architecture from the early 1800’s when AJ Downing and Calvert Vaux contributed their expertise, making the Newburgh landscape what it is today. 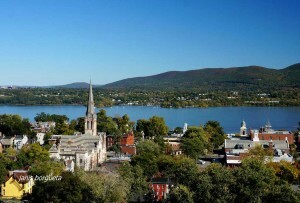 What many people don’t know is that Newburgh is home to the largest historical district in New York State. Many of these homes remain in pristine condition. Homes in various stages of preservation are available and on the market. The most amazing part? These homes are priced well and actually affordable. Many homes have recently been refurbished and other remain a diamond in the rough. Buying a home in the City of Newburgh can be an adventure. Our local community supports renovations and new owners with enthusiasm. Seems every week a new Brooklynite joins the ranks of a home owner that has found their niche in our community. They have researched and learned about building codes and renovating historic properties. While that process is not for everyone, those that are not up for the adventure buy completely renovated homes. While these homes have a higher price tag, but remain surprisingly affordable. Move in and there are no worries about the renovation process. The options are endless. The local Historical Society provides walking tours frequently. Each December they also conduct a Candlelight Tour of Historical Homes that is quite amazing. Local homeowners volunteer their homes and open their doors to the public for viewing some of the most amazing architecture for miles around. Be sure to get tickets and join in. City of Newburgh Homes for Sale are varied in price, style, age, and condition. I have streamlined the process for you to further your search. Begin here to see what historical homes area currently available. This is a live search and features the newest active listings on the Hudson Gateway MLS. More specific searches are available below. Feel free to browse and if you want to create your own search just let me know.